Get veterinary services in your home, providing more personal service and a less stressful environment for your pet. Adam Behrens, VMD seeks to provide the highest level of veterinary primary care and customer service in the comfort of your home. Responsive follow-up consultations are provided by email and phone. Referral for specialty care is also available. 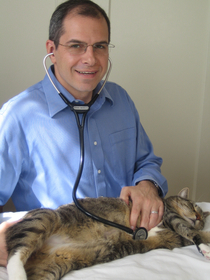 Dr. Behrens offers mobile veterinary services for cats, dogs, and small mammals. He caters to the individual needs of you and your pet. This is something that is often missing in the hectic clinic setting of many busy hospitals. His goal is to provide personal service in a less stressful environment. The overwhelming majority of visits to a primary care veterinarian can easily be accomplished outside of the hospital setting. And a number of services, such as humane euthanasia, are best provided at home.